A fitting end to the first five films in the Battles Without Honor and Humanity series. Jô Shishido is in this one which was a nice surprise. They made an additional 4 films after this one so the final episode moniker is a bit of a false statement. Unsurprisingly, Fukasaku's mobster epic closes on a down beat as a new generation of yakuza take the reins and the cyclical nature of violence takes over, despite Hirono's best efforts. The restructuring of the mob as a political entity had some interesting potential that was left frustratingly unexplored, but the expected scheming, murders and wild scraps are all there. One final note: all the music in this series is excellent. I can't imagine it ending any other way. This wonderful series doesn't really conclude in a satisfying way. A major problem of this 5th movie is that there is never a 'wow' moment that you'll remember once it's over and the fate of most characters won't be clear at all. It still has the ingredients that made the other movies so cool, but we're getting used to them by now. 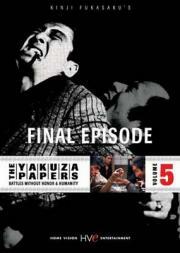 I did like the idea that the Yakuza are trying to become a political coalition, shame it wasn't developed further. These have gotten better as it progressed so I can't help but be disappointed. As this, so clearly states, is the final episode, you'd expect it'd be a lot more exciting and satisfying than it's predecessors. Instead it just kind of fizzles out. So I'll openly admit that my expectations had a serious influence on my experience. That electric cinematography is still there though and as great as ever. Oh and Tsushima's score is brilliant in all 5 as well.